Be honest. How many times a day do you find yourself wishing that you had more than 24 hours? Or you might catch yourself thinking during your shifts, "I don't have time to do this. I have to hurry." This week, I'm exploring a concept of time that was introduced in Gay Hendricks' book, The Big Leap. Although it feels like time is limited and that we're bound by its constraints, I'm going to blow your mind today by showing you quite the opposite. Our brains are sneaky but powerful, and discovering how you can take full control of your time is going to be life-changing. I'm sharing a practice you can use to assess how you're actually spending your time at work so you can start fixing it if you're feeling short every day. Tune in to start living deliberately, instead of just reacting to your surroundings and your time limitations. What is going to block you from losing weight permanently. How to harness more control over your time. Why how much time you have is totally up to you. How to do an "honest time assessment." My personal story about time and how I gained more of it. Why not asking for help is a time waster. Hello amazing nurses. Welcome to another episode of Permanent Weight Loss for Busy Nurses. Now, today I'm recording this podcast in the morning. I got my blanket on. It's pretty cold here in LA for some reason. It's spring time. I don't know why it's cold. But anyway, I'm here this morning to talk to you about time and not having enough of it. Oh man, my last shift was just one of those days where you're literally like, being called by somebody every single minute. It was like, Charmaine, you have a phone call, Charmaine, they're ready for you in rounds, Charmaine, your patient wants a PRN, Charmaine, your patient has to go to the bathroom. Like, just one of those days. Do you know what I'm talking about? All you guys like, I had five patients total, and I know, before all of you start talking about the ratios, I am in California. We do have those ratio laws so in psych, according to the union, we could have six patients max. I'm curious to know what it's like for you guys in other states if you don't mind filling me in, but anyway, so in psych, five patients in the day is actually quite a bit in my hospital. And so I had five patients total, including an admission and discharge and I had some patients with medical issues too so the day just flew by. But here's the thing; before, I would think a day like that would be terrible and unfair. Like, why am I the only one running around like crazy and the other nurses are just sitting down and going on their breaks and having a grand old time? I used to be in my own mind drama about that the whole time. But what I learned about having days like this is what I'm about to teach you in today's episode, which is the way we look at our time and the way we look at our day. What we decide to do, all of it matters. And I wanted to say that at the end of this shift, that busy crazy shift where was I being tugged in all these directions and everyone was asking for me, I was still able to leave on time. I did all my charting in a timely manner and I felt great about my day. I didn't feel overwhelmed, I didn't feel frustrated. I just felt accomplished. And I want to show you that you can feel the same exact way and that you could feel great about your busy shifts also. So this brings me to the topic of today's episode, which is all about time. Now, you might be wondering, "I thought this was a weight loss podcast. Why are we talking about this? I want to know how to burn fat, dang it." And for sure, what you eat and the quality of foods you eat completely 100% matters and it's super important to me. And in the upcoming episodes, actually in a very, very soon episode, I'm going to give you a sneak peek for episode number five, I will talk about food that matters and food that's high quality and what to eat to burn fat. I'm going to talk to you about what to eat and what will help you lose weight. Don't get me wrong. But what I've found after coaching several nurses and even having personal training clients over the past few years is this; in reality, I can tell you every single thing you need to do. I can tell you what workout to do, I can tell you what to eat, I can tell you exactly what to do step by step, literally hold your hand through it, but at the end of the day, what I discovered having clients, coaching nurses, coaching personal training clients as well is that literally none of that information will matter if you're not in the right mindset. And here's why; if you don't think you can lose weight, you won't. I can give you all the food information you need but none of it will be helpful if you're having a thought in your brain that is literally blocking you from losing weight. 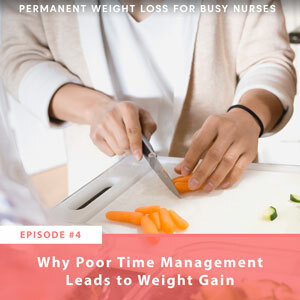 And one of the biggest and most common obstacles and pushback that I hear from my nurse clients is this idea that there's just not enough time. There's not enough time to prepare or plan meals ahead, there's not enough time to go to the grocery store and go shopping, there's not enough time to go to the gym. And as we talked about in my last episodes, your thoughts create your feelings, and a thought like this is going to feel unmotivating and will literally block you from losing weight permanently. This is why I wanted to break it down for you so you can always be in complete control over your time and your life because guess what? It's completely possible and I'm going to break it all down just for you in this episode. So before I dive in, I wanted to explain what time actually is, first of all. Like, what is time really? And it's so funny, my boyfriend is - just a side story. My boyfriend and I, his name is Michael, we're complete opposites. It's so funny. We actually just went to a health and healing expo in Thousand Oaks not too long ago and we stopped by this booth and one of the exhibitors was this - he didn't even know how to describe himself. He was kind of like a life coach but he can read your energy, almost like a psychic but not. It was interesting. Anyway, so the first thing he said when we stepped to his booth was he said, "Wow, you guys have completely different energies. It's so interesting, you guys fit into each other's energy like a puzzle piece," or something like that, and I just thought that was so funny. He said in a past life, my boyfriend was a scientist and I was cracking up. Anyway, more on that story later but I just thought that was funny. Anyway, so my boyfriend is a total nerd and I'm not. Not at all. But anyway, so he's a total physics nerd and I'm sure he's going to - if you ask him what time is, he could give you this long-winded and complicated explanation of what time actually is, but for me, I need things to be simple. And I'm not a physics guru, so here's how I'm going to define time. So to me, I'm going to define time in this podcast as a mental construct. So a few months ago, I was reading this book, The Big Leap by Gay Hendricks, and I thought the way that he described time was literally the most helpful and the most fascinating way to put it. He said in his book that you are where time comes from. And I thought that was so mind-blowing like, you are where time comes from. But what does that even mean? It means that time is created in our minds. We create our time. Again, time is a mental construct. It's something that exists only in our minds. It's not tangible, it's not in a solid form. It's literally a concept that we've created and that we've all collectively agreed upon as a society as something that measures events that succeed one another from present to future. Isn't that fascinating that time is literally something that only exists in our minds? And because time is literally created in our minds, here's something else that's pretty interesting. How much time we have is totally up to us. How we think about our time is our choice. And Gay Hendricks breaks this down in his book in further detail, which I'll describe here in this podcast. He describes two different types of time. One he calls Newtonian time, which is basically this idea that time is limited. It's this idea that most people think about time that time is limited, there's only a certain amount of hours in the day, and there's literally not enough. Raise your hand if you agree with this. But not raise your hand if you're driving please, keep your hands on the wheel, thank you. And the other time that he introduces in this book is what he calls Einstein time. So as I explained in episodes number two and three, the way we interpret any situation we're in is what determines how we feel about something. If we're constantly feeling busy, it's because we're thinking we have no time. But remember, time itself is neutral. The fact that there's a certain amount of hours in the day, that is literally it. 24 hours in the day, that is neutral. That's just the facts of the situation and that is literally it. So if we think of time as our neutral circumstance, what is our thought about it? For example, notice how differently you feel when you tell yourself, "I have no time at all to do this. I have to hurry, I have to hurry, I have no time," versus, "I have all the time in the world." And again, going back on this idea of Newtonian time and this idea that time is limited, that there's 24 hours in the day, which is our circumstance, we can't change that. But the way you're thinking about it though, notice it's kind of sneaky. Your brain will be a little sneaky, but most of the time people will commonly tell me things like there's only 24 hours in the day. There's only 24 hours. And think that to yourself. If you think there's only 24 hours in the day, that already feels disempowering because you're thinking there's not enough time already. You're already telling yourself that time is scarce and we have to go find it wherever we can. And this is why mindset is so powerful. We can actually choose to think about our time however the heck we want. If you are thinking right now that you only have 24 hours in the day, I want you to ask yourself how thinking about time in this way is useful or helpful to you. Seriously, if you can't come up with a way that this is helpful for you, that this mindset that there's only 24 hours in the day, if you can't think that's helpful in any way, I want to offer to you that the way you're currently thinking about time is completely optional. So the other concept of time that Hendricks teaches about in his book, The Big Leap, is this idea of Einstein time, which means that you are the one who decides how you think about your time, that you are the one who creates your time because you can make as much of it as you need. And when I learned this, this literally blew my mind. I remember that night when I was reading the book in my bed, and I read that and I was like, hold up, what? And I re-read the sentence over and over and over. I re-read the chapter. I was like, hold up, wait a minute, I make my time? This is some trippy - this is trippy, dude. But I did have to stop and rewind and be like, hold up, what does that even mean? So he says in his book that you are fully in control of your time and embracing it and you're taking full responsibility for how you spend your time. And this is so much more empowering because you know that if at any time you feel like you have no time, it's only because you're thinking a thought. But if you consciously decide that you do have time because you create your time, then you'll feel much more in control and much more empowered. Imagine in one of your previous shifts, it's like when you're done with all your chartings, your ADLs, your meds, and you just sit down and you have nothing to do, and it literally feels like the minutes are just moving so slowly. Like, who here has felt that? Like, on a weekend I know for me in my hospital, weekends tend to be more chill, especially Sundays. Oh my god, I love Sundays. But anyway, so imagine that. You're done with all the things you have to do and then you're just sitting there and you're watching the clock thinking, "When will this shift be over? There's nothing to do." But on the other hand, the time you spend with a loved one only feels like a few minutes have passed because you're thinking differently. You're present in this person's company and when it's over, you might think, "Time went by so fast." And that's because we are the ones who create our perception of time. How we think about our time determines how we feel about our time. Now, in order to create more time, the first piece, like I mentioned is knowing what we are thinking about time. Gaining awareness of what we think about our time. And the first step to do that is what I call an honest time assessment, or an honest time audit. So, making an honest time assessment of your day means how many times in the day do you find yourself wishing you had more time. Really try to be conscious of it and notice it. You can even try counting the number of times you ask yourself that question or saying those things to yourself like I wish I had more time, I wish I had more hours in the day. Really literally, count it if that helps you, but how many times in the day do you catch yourself wishing you had more time? And when you do wish you had more time, how does that feel when you think that to yourself? Typically, when we feel like we have no time, that's because we're reacting to the situations around us. We're not really aware of how we actually spend our time and it feels like time is slipping away from us. And I know for me, in the shifts that are the busiest, the craziest, the ones where in my last shift that I said in the beginning of this episode, those days where there's a lot of things coming up, there's a lot of phone calls, there's a lot of activity going on in the shift, that's when - and then I start going into this mindset like, oh gosh, there's so much to do, there's so little time. When I get into that mindset, that's how I know I'm reacting to what's around me instead of taking full control of what I'm thinking about what's around me. You notice the difference there? Once I see that I'm getting into this mindset, I catch myself and I know I'm losing touch with the present moment. I'm not being present. I'm starting to get caught up in my own head and my own thinking. So if you do an honest time assessment of your own day, of your own beliefs about time, then time won't be this allusive thing anymore that you don't have control over. You'll know exactly what you're doing, what you're thinking, what you're feeling that's taking up your time. So that's why a big part of this podcast that I want to emphasize to all of you is that in order to fix any problem you have in your life, whether it's weight loss, whether it's not having time, whether it's trying to figure out a problem on the unit, to fix any problem, we have to know the cause. And if you want to have more time in the day, you have to discover where you're currently investing in your time and then consciously decide how you actually want to spend your time so you can achieve your goals. Now, let's take this one step further and actually take a look at how you actually spend your time in the shift, and I want you to be very honest with this because the more honest you are, the more we can fix this in the future. So ask yourself, you could even think of your last shift or your last few shifts. Ask yourself these questions. How much time in the shift do you spend talking to your patients and how much time in the shift do you spend talking to your coworkers? So, I want to say first of all that I'm the biggest fangirl of Cy Wakeman. She is a renowned speaker, she travels the country to do talks at conferences, and I'm going to be talking about her a lot, just a heads up, on this podcast because I love her. She is incredible. I saw her speak at the ANCC annual magna conference last year in Denver, Colorado, and she was the keynote speaker and I - when she was talking, oh my god, the whole time I was just nodding my head, I was just like, saying yes, yes, and clapping, that kind of thing. And then at the end I gave her a standing ovation. Anyway, Cy Wakeman calls herself a drama researcher. And I think that is literally the coolest thing I've ever heard. So she researches drama and how much time people spend on engaging in drama at work. And this could be engaging in conversations about things that aren't necessarily useful, and it's basically she measures the amount of time people spend talking about a problem rather than finding the solution. She said in her talk that people on average spend 2.5 hours in drama mode at work. 2.5 hours every single day is spent either venting or complaining about something, which I found completely fascinating. And if you want to look her up in the show notes, I highly encourage you to do so. She has the No Ego Podcast, she has her own show on YouTube. And I follow her Instagram all the time. She is amazing. But anyway, bring this back to you and your day and notice what you do during the shift and observe it. Observe it with no judgment but just curiosity. Notice how you spend your time. Are you charting on time? Are you talking to your patients? How much time do you spend bathing your patients? Are you delegating your tasks or are you doing everything yourself? Observe your behaviors at work without judgment and also ask yourself things like how much time are you taking on break, how much time are you talking to your coworkers? Even if it's just small talk, all little conversations throughout the day can add up pretty quickly. So then, after you do that, after you really take that time to assess your time, do an honest time assessment, the question becomes do you want to continue spending your time in this way? Are these things useful to you or are they just distractions? Really commit to this idea that you can create your time. So, in summary to wrap it up all here because I know we talked a lot about time and a lot about things here in this podcast episode, but in summary, I talked about the book, The Big Leap by Gay Hendricks, that time is a mental construct, that we have the opportunity to think about our time in whatever way we choose and we can make our time, depending on how we think about it. How you spend your time is always your choice and your responsibility. And the amazing news, like the best news I could give you all day is you get to decide what you want to think, feel, and act in regards to how you approach time. Time is neural, but if you allow your circumstances around you, your circumstances at work, your circumstances at home, your family, your school, if you allow all those circumstances to determine how busy you feel, you are disempowering yourself and your ability to have control over your schedule and your own life. Look at what you find non-negotiable in the shift in your work. Like med passing, charting, going to rounds. Look at the non-negotiables, that's what I call it when I make my schedule. The non-negotiables. Look at that and then look at the times you do things in the day that are optional. And then decide what you want your schedule to be like. Live deliberately rather than reactively and take full responsibility for your time. I just wanted to share with you really quickly my own personal story about time, which I think would be very helpful because I feel like sometimes as a coach, people might think that I didn't have my own struggles or I didn't have my own obstacles for myself to overcome because I'm a coach and because I have a podcast. But this is farther than the truth. I'm here, where I'm at because I've had these experiences. So my personal story is that before, a few years ago, I always felt like I was at the effect of my work. And my coworkers always called my Speedy Gonzales when I started out, especially as a new grad because I did everything. I always stayed overtime to chart because I was everybody's nurse. And for example, can you think of maybe a nurse who would go into your patient's room and do everything for them without asking you? Yeah, that was me. Hey guys. So I did everything because I thought I was being nice, but the truth is I was afraid to say no. I didn't want to face the possibility of someone being upset so I just did everything and people-pleased my way to the end of the shift. And I always stayed overtime. I think I stayed overtime to chart literally almost every shift for a good two years. The first two years of my nursing career, this is no joke. I literally stayed overtime at least half an hour to do my charting for a good two years. And then I finally did an assessment of my time, an honest time assessment, and I realized how often I would have conversations with people. Like, every conversation would be about five to 10 minutes and then it was one conversation to the other, and I had to be comfortable with learning how to tell people that I couldn't talk or that I had to finish my task first and then I could continue talking later. But I noticed all these conversations were taking up a huge chunk of my time. So I would make sure I charted in a room that was away from people so I could have focused time to chart. And I would schedule time in the afternoon, after I'm done with all my tasks and just have this laser focus on my charting only for about a good hour. I would set a time limit for myself to chart only within the hour and be super focused. Laser focused. I wouldn't go on my phone, I wouldn’t check my email or anything. And then after that, I would go back on the floor and do more. Try to help people out if I could. Now I'm super proud to say I never leave work late. Rarely. And I think the only time I left late once this past year was literally just to finish up an admission that came towards the end of the shift and this was my conscious decision, you guys, 100%. I'm taking ownership of the fact that I stayed late that shift to just finish that admission just because I wanted to. So nowadays, I don't allow any distractions to interfere. I am firm with my choices and I stick to them, and they're non-negotiable. I don't allow any situation around me to distract me or move me away from my schedule unless it's something unpredictable, obviously, that we couldn't ever see coming like a code or a fall. But even in those situations, I always ask myself how I can get the help I need. That's another piece too. I feel like in the nursing world, there's this idea of martyrdom, like we want to be tough by not asking for help for some reason, and it's like, not asking for help is such a time waster. So many of us don't want to face the discomfort of delegation so we do everything ourselves, which I'm definitely going to talk about in a future episode for sure, but I just want to say that being busy doesn't mean that you're a better or more efficient nurse. Really drill that into your mind. The busier you are, it doesn't mean that you're more efficient or more effective as a nurse. Asking for help is not a sign of weakness. It's actually a sign of strength. And even then, you're taking that time to really let yourself know that okay, you know where you need help. You're acknowledging that you can't do everything alone, so I think it's honestly way more powerful to ask for help. And nurses actually do want to help, so take that help when it's offered to you. Now, before I go, I’m inviting you to join my podcast launch giveaway. And to celebrate the launch of my new show, I’m going to be giving away Starbucks gift cards because coffee is the best. Who doesn't love a fresh cup of coffee? And it will only be those of you listening to my podcast. I'm only going to be giving away Starbucks gift cards to three lucky listeners who subscribe to my show and rate and review the show on iTunes. And it doesn’t have to be a five-star review, although I sure hope you love the show. But what I'm looking for is your honest feedback because I want to make this the most resourceful, the most valuable, and the most amazing show that provides so much value for all of you. So to join my giveaway, go ahead and visit www.thenurseweightlosscoach.com/itunes to learn more about the contest and how to enter. I’ll be announcing the winners on the show in an upcoming episode, to tune in. Alright my amazing nurses, thank you so much for listening. If you're going to work today, practice what I taught today and practice taking a look at how you spend your time and then decide how you want to spend your time. Have a great shift and I'll see you again next week.